This rosary can be prayed as a novena from Passion Friday until Holy Saturday (inclusive). 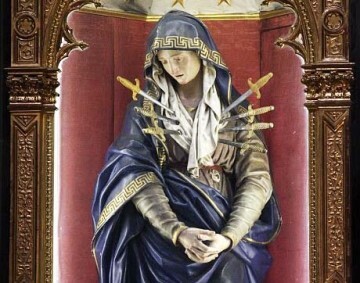 3 Hail Mary’s for the tears Our Lady shed in the Passion of Christ. Prayer: O God, in whose Passion according to the prophecy of Simeon, the sword of sorrow did pierce the most sweet soul of the glorious Mary, Virgin and Mother; mercifully grant that we who call to mind with veneration her anguish and suffering, by the glorious merits and prayers of all the Saints who faithfully stood by the cross interceding for us, may obtain the blessed fruit of Thy Passion. Who livest and reignest with God the Father, in the unity of the Holy Ghost, one God, world without end, Amen. "Never forget to renew continually the offering of the Precious Blood. My Mother is untiringly imploring Me, and together with her a great number of penitent and atoning souls. I cannot deny her anything. Therefore it is thanks to My Mother and because of My elects that those days are going to be shortened. 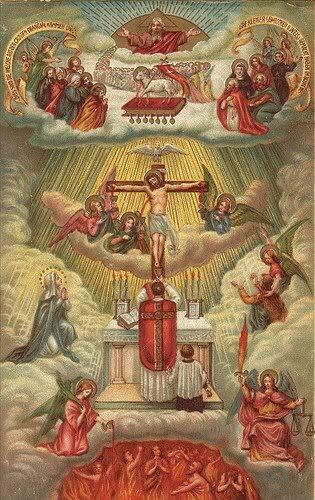 "Be comforted, all of you who give honour to My Precious Blood; nothing evil will happen to you. "I will inspire My Representative continually to exalt the Sacrifice of My Precious Blood, and the Veneration of My Mother." (p. 45, Prophecies of La Fraudais). "On November 25, 1873, Marie-Julie, all of a sudden, is seized with a violent pain and falls into ecstasy. 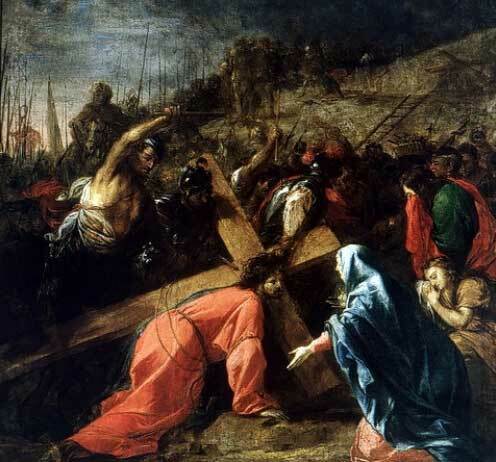 She sees Our Lord carrying His Cross on His left shoulder and the blood flowing from that lacerated shoulder. She herself experiences a vivid pain on her left shoulder. After the ecstasy, her mother will ascertain, behind her daughter's shoulder a new wound in the shape of a cross.
" 'I will treat with a preference whoever will meditate upon this wound ... I will come to seek devotees to My Holy Shoulder. I shall comfort them at the moment of their agony.' " (p. 20, The Prophecies of La Fraudais). I hail you, I adore you, I embrace you, oh adorable Cross of My Savior. Protect us, keep us, save us. Jesus loved you so much, by His example, I love you. By your holy image calm my fears, so that I may only feel peace and confidence. O Crux Ave, spes unica "Et Verbum caro factum est." Oh Jesus, conqueror of death, save us. “My beloved, little friends, you will wear on yourself my adorable Cross which will protect you from all kinds of ills, big or small and later, I will bless them. The blessings attached to this cross are very unique. The Sacred Heart promised to Marie-Julie Jahenny that a dying person who kisses this cross with love and sorrow for their sins, or if they cannot kiss it, who merely holds it in their hands (with the same sentiments) will be saved from the eternal flames of hell. This scapular is called the Scapular of Mt. Carmel. We should wear it around our necks (hidden under our clothes) during daytime and nightime. By wearing it, we are wearing the habit of the Blessed Virgin herself. We are putting ourselves under her protection and her guidance when we wear it always. It therefore has the promise of salvation from an eternity in Hell, as well as the conversion of sinners. 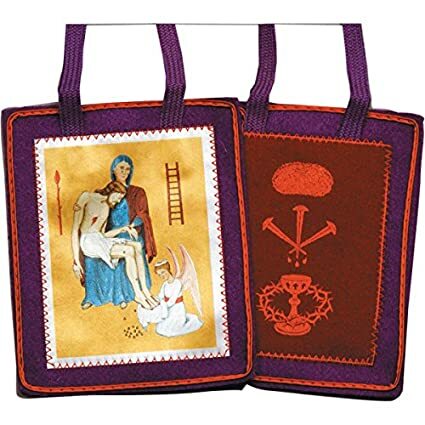 This scapular is very powerful in obtaining conversions when placed around the necks of the sick and dying. Pray the holy rosary daily -- pray the fifteen-decade rosary if you can. Pray the Joyful, Sorrowful, and Glorious Mysteries only. The Holy Rosary is the most powerful weapon that we have against the world, the flesh,and the devil. 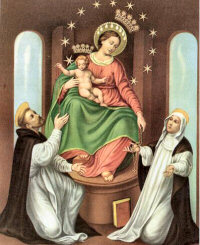 The Blessed Virgin Mary told us that in the End Times, we would only have the the Holy Rosary and her Brown Scapular. "Every kingdom will end up: but the Blessed Virgin's one will always remain in existence in Heaven and on earth. She was the first one to be a tabernacle of grace. She was carrying within herself the most pure wheat-ear; the wheat which would be the food and strength of her people." (January 12, 1882, p. 230, The Prophecies of La Fraudais). This medal was given to us by Our Blessed Mother, specifically for the protection of our younger and older children. 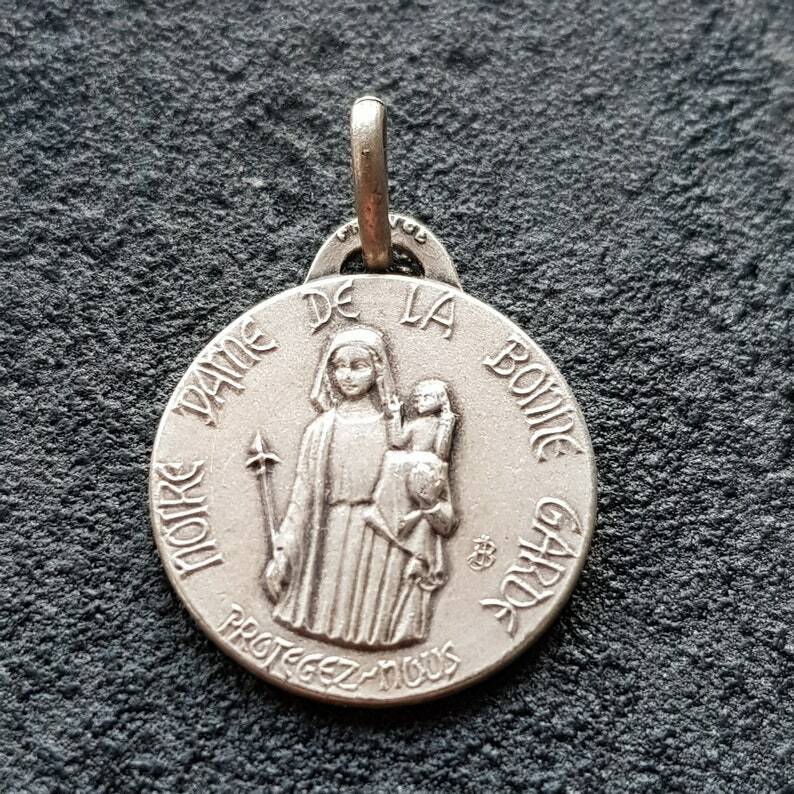 The words on the back say: “O you Holy Virgin who crushed the head of the snake, protect our faith and the innocence of our little children..."
This medal will preserve innocence, at a time which will be so difficult, when corruption will be wide-spread.
" 'I am speaking,'He says: 'listen to My voice. Death is above your heads. The fatale blow is ready. Gaze upon the Sacred Heart who shall be your refuge.' " (p. 92, The Prophecies of La Fraudais). "See that, at the time when I shall save My people, it will not be through any power of men. My Divine Heart is the one who, alone, will bring salvation to this kingdom which will be left but a shameful disorder, where wickednesss will be prevailing in full triumph." (p. 94, ibid). "A hellish fierceness will arise against the devotion of the Sacred Heart." (p. 97, ibid). "Fire-hail, proceed to the earth to harvest the enemies of My Sacred Heart; . . . be prepared My children, make ready. At any moment, expect that terrible hour. 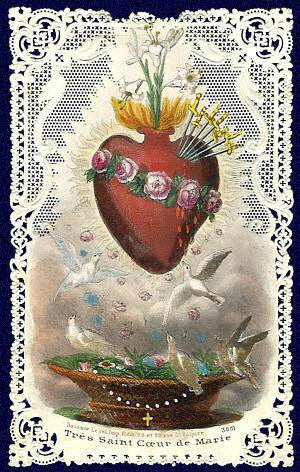 I [the Sacred Heart of Jesus] will protect you." (January 9, 1878, p. 231, ibid). 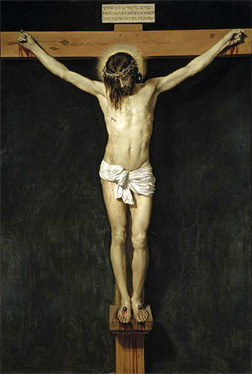 I hail Thee, Jesus Crucified to let me live. I hail Thee with all the joy of the Angels and of the Saints on bringing Thee down from the Cross. I hail Thee with all of the sorrow of Thy Mother when Thou rested on Her Immaculate heart and on Her lap. "My children, very few souls think of wiping the adorable wounds on My feet when the blood flows and I wish this representation to be know. Little thought is also given to the tears shed by My Mother during My Passion: those tears are at the feet of the Angel who wipes My sacred feet. 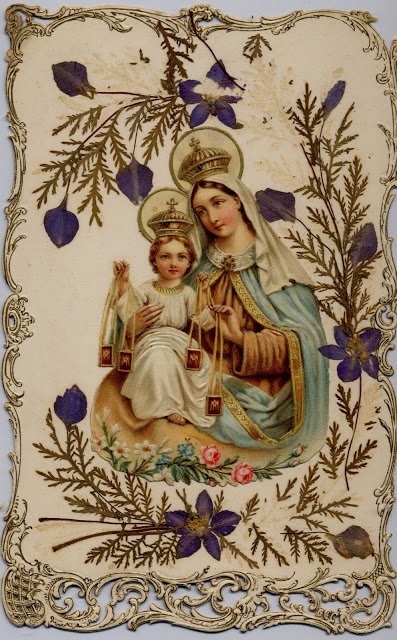 By this scapular, I wish you to think about that ladder, that reed and those nails of My Passion."